With the increasing demand for smartphones, tablets, LCD screens, and other consumer electronic products, the global market for flexile printed circuit boards (FPCBs) is observing a high-paced rise. The aviation and the defense industries are also emerging as key end users of these boards, which is likely to support the growth of this market in the years to come. The opportunity in this market is expanding at a healthy CAGR of 11.80% between 2018 and 2026, increasing from US$13.51 bn in 2017 and rising to US$38.27 bn by the end of 2026. The increasing awareness about the advantages of FPCBs in comparison with rigid or conventional PCBs is also projected to fuel the demand for them over the forthcoming years. The global market for flexile printed circuit boards is broadly analyzed on the basis of the type of the board and end user. Based on the type, the market is categorized into single sided flex circuits, double sided flex circuits, rigid flex circuits, and multi-layer flex circuits. Among these, the multi-layer flex circuits segment led the global market in 2017 with a share of 35.77% and is projected to remain on the top over the next few years. By the application, the market is classified into the instrumentation and medical, computer and data storage, telecommunication, defense and aerospace, consumer electronics, automotive, and the industrial electronics sectors. The demand for FPCBs is comparatively higher in the consumer electronics industry and is expected to remain so in the near future. The worldwide market for flexible printed circuit boards is also studied on the basis of the geography. North America (U.S, Canada, and Mexico), South America (Brazil and the Rest of South America), Europe (The U.K., Italy, France, Germany, and the Rest of Europe), Asia Pacific (Japan, China, India, South Korea, and the Rest of Asia Pacific), and the Middle East and Africa (the UAE, South Africa, and the Rest of Middle East and Africa) have surfaced as the key regional segments in this market. In 2017, Asia Pacific dominated the global market with a share of more than 56%. Researchers project this regional market to continue on the top in the years to come, thanks to the high-paced growth, fueled by the increasing demand for electronic products and the presence of a number of flexible printed circuit board manufacturers in this region. Some of the leading players functional in the global market for flexible printed circuit boards are Career Technology (Mfg.) Co. Ltd., Flexcom Inc., Daeduck GDS., Fujikura Ltd., Sumitomo Electric Industries Ltd., Multi-Fineline Electronix Inc. (MFLEX), Interflex Co. Ltd, Nitto Denko Corp., NewFlex Technology Co. Ltd., and NOK Corp. These players have deep rivalry between them and the competition within this market is expected to intensify substantially in the years to come. Global Flexible Printed Circuit Board (FPCB) Market report provides analysis for the period 2016 – 2026, wherein the period from 2018 to 2026 is the forecast and 2017 is the base year. The data for 2016 has been included as historical information. The flexible printed circuit board report covers all the major types and end-users playing significant role in the global flexible printed circuit Board market’s growth over the forecast period. The report also include various drivers, restraints, and opportunities expected which affect market’s growth during the above mention period. The study provides an entire perspective on the market’s growth in terms of revenue in US$ Bn across different geographical regions such as Asia Pacific, North America, Middle East & Africa, Europe, and South America. 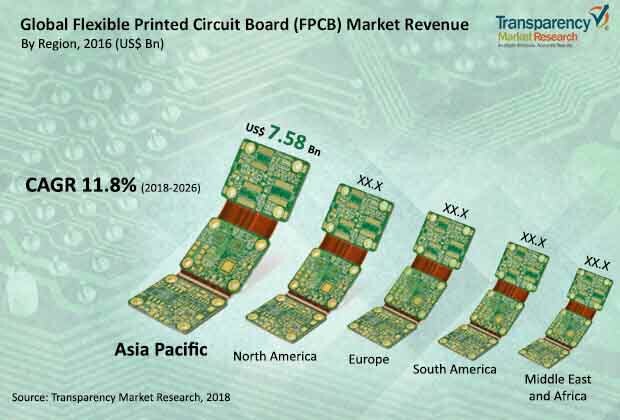 The report also includes competition landscape which includes competition matrix and market share analysis of major players in the global flexible printed circuit board (FPCB) market based on their 2017 revenues and profiles of major players. Competition matrix benchmarks leading players on the basis of their capabilities and potential to grow. Factors including market position, offerings and R&D focus are attributed to company’s capabilities. Factors including top line growth, market share, segment growth, infrastructure facilities and future outlook are attributed to company’s potential to grow.